This article was originally published by the Harvard International Review on 21 January 2016. A frequent rebuttal by apologists of Putin’s policies, in debates on Western approaches to Eastern Europe, is the allegation of Russophobia. 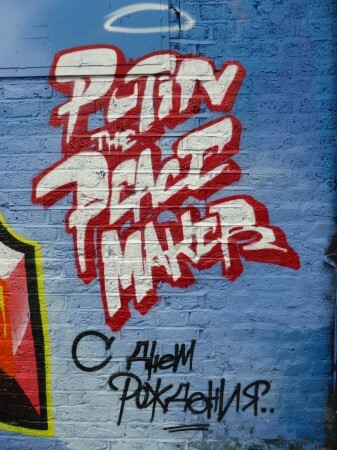 Interpreters of contemporary Russian affairs, who present themselves as Putinversteher (German for “those who understand Putin”), accuse critics of Moscow’s recent foreign and domestic policies of a lack of empathy for, or even of xenophobia towards, the Russian nation, as well as its traditions, worries, and views. Such allegations are usually accompanied by a reference to Vladimir Putin’s impressive performance in Russian public opinion polls. These interpretations are often embedded in historical-philosophical deliberations about the role of Russia in Europe and the world – for example, about the history of, and lessons from, Russian-Western collaboration in the past. Putin as the Russian People’s Representative? As is well-known, high rates of official public support for non-democratic rulers are not unusual. The Germans, for example, once overwhelmingly supported a leader who was much more autocratic, intolerant, murderous, expansionist, and aggressive than Putin. Yet should Hitler’s high popularity in the 1940s, even after his death, make him deserve more careful consideration because he temporarily had the support of a large part of the German nation? One could list dozens of dictators who were praised during and shortly after their repressive rules. Nonetheless, many of these once-admired hyper-patriots left behind ambivalent, if not catastrophic legacies. More often than not, their crimes affected not only surrounding states and ethnic minorities. Many such previously popular autocrats – some less, some more tolerant towards their oppositions than Putin – also brought many sorrows to the titular nations of the countries they had been popularly ruling for years or decades. Moreover, it is difficult to establish the degree of validity of public opinion research results, under conditions of ideological monism and political repression. What does Russian polling data actually tell us? Is Putin’s popularity really as high as the respondents’ answers suggest? How ready is a citizen to openly express her or his political views, towards an anonymous interviewer, in an authoritarian system dominated by former Soviet state security officers? Are the preferences recorded in the polls indeed reflective of the entire gamut of worldviews of the respondents? To what degree are such views shaped by plural sources of information provided by professional journalists? Whoever has had the opportunity to watch the political news and talk shows of the dominant Russian state television channels for a few days knows that these are not media in the Western sense of the word. The emotionality, aggressiveness, and absurdity with which the government-appointed TV propagandists misrepresent many processes in international affairs as anti-Russian plots may be difficult to imagine for somebody who is unfamiliar with the Russian language. The daily spread of domestic and foreign political hate speech, craftily formulated half-truths, and increasingly bizarre historic myths in the Kremlin-controlled television channels goes beyond what Moscow’s international audience is presented by “Russia Today” or “Sputnik News,” in various foreign languages. There is, in fact, no proper political mass journalism remaining in Russia, in as far as all media with wide reach in the population disseminate roughly similar mélanges of purposefully selected world news, crudely manipulated political stories, and manifestly abstruse conspiracy theories, including numerous contradictory stories invented to explain away the Kremlin’s responsibility for the shooting of the MH17 airliner over Eastern Ukraine in July 2014. To be sure, Russian opposition members, decent social scientists, foreign Kremlin critics, and free-thinking intellectuals do appear on state TV’s late-night shows. Their carefully calibrated presence, however, functions only as decoration designed to create, for the Russian viewers, an impression of political pluralism and freedom of speech, and to provide a target for the numerous Kremlin apologists in the studio. Often the judiciously selected “dissidents” are, in the talk-shows, shouted down by the Kremlin’s representatives, interrupted by the shows’ moderators, or even publicly ridiculed by the Russian government’s defenders. They are mere extras in a political theater play with predetermined dramaturgy. Therefore, many opposition members and serious analysts only rarely or never take part in the pseudo-debates on Russian state TV – although they (including this writer) do get invitations, and thus have the theoretical opportunity to reach a mass audience for a few minutes. The KGB as the Essence of Russianness? Not only from a sociological viewpoint, apologies for Putin are founded, at best, on naïve misunderstandings, and, at worst, on purposeful misrepresentation of public opinion in present-day Russia. From a historical point of view, too, the pointed respect of Western Kremlin apologists for the demonstrative russocentrism of the Kremlin’s current leadership is misguided. To interpret Moscow’s current policies merely as a manifestation of centuries-old Russian traditions ignores the tragic course of recent Russian history and its effects on post-Soviet Russia. Historically alert observers of Moscow’s official public discourse will feel skepticism when the current political leadership of Russia is posing as an international defender of family values, conservatism, and religiosity. Why should a country that harshly oppressed its own cultural and religious institutions for 70 years now lecture other nations, such as Western European or North American ones, with far greater historical continuity and appreciation of their traditions throughout the 20th century? The Bolsheviks’ radical anti-traditionalism would suggest that post-Soviet society should, for many more years, be fully absorbed by the rediscovery and revitalization of its own historical traditions, and should be busy with that task rather than promoting conservative values abroad. A Russia proud of its Soviet legacy is one of the last European countries with the authority to call on other states to defend their national traditions and Christian civilization. Worse, some of the most powerful men in the current Russian leadership, among them Vladimir Putin, Sergei Ivanov, and Igor Sechin, come from the very state organ of the USSR that for decades put into practice the Bolsheviks’ enmity towards the Russian empire’s pre-revolutionary national – including Eastern Slavic – cultures, traditions, religions, and science. The KGB was not an intelligence agency in the traditional sense, but the core of the Soviet repressive apparatus. It persecuted any form of independent thought in the Soviet Union, among them Russian national ideas, and all churches, including Russian Orthodox ones. Less than thirty years ago, numerous members of today’s Putinist ruling class were professionally fighting exactly those Russian national values, traditions and institutions that they now so ardently defend, praise, and promote. The leitmotif of the current Kremlin leadership is not genuine nationalism or deeply felt traditionalism, but rather a form of power politics whose cynicism, randomness, and lack of principle are, for some Western observers, difficult to comprehend. For the purpose of protecting the regime, this largely value-neutral approach may one day push nationalist ideas and the next day internationalist norms. Without batting an eye, it may cite religious motives, or alternatively stress enlightenment principles. It frequently pursues moralistic arguments, yet overtly demonstrates cold-blooded amoralism in its actions. It draws upon, depending on the situation, both universal human values and ethno-national interests. It sometimes insists on objective historical accuracy, but on other occasions claims its right to selective historical memory. It does not see any contradiction between the one-time desire to join NATO and the current demonization of the alliance. Modern EU standards can at the same time be an example for Russia to follow and an expression of disgusting Western decadence. Russia appears at one moment as a modern European nation, another as a Eurasian civilization, once as a devoutly Orthodox country, later as a modern and progressive state – with the changes in perspective driven by current political expedience and the respective audience’s preferences. For the case of German observers of this strategy, East Germany’s historical experience with the Stasi, or the eastern German Democratic Republic’s Ministry of State Security, rather than studies of Russian history or literature, can offer relevant psycho-historical reference points for assessing the present behavior of Russia’s leadership. Post-Soviet utilitarianism, rigid personalism, and normative relativism – and less so Russian traditionalism or nationalism – are the main factors driving Russian foreign policy. Instead of rooting around in Putin’s opaque psyche or rumor-filled childhood, analysts should explain Russia’s present behavior by exposing the power-political calculations of Russia’s rationally – though rather short-term – thinking millionaires and billionaires. A similar rule applies for assessing the Kremlin leadership’s recent adventures in Moldova, Georgia, Ukraine, and Syria. Those who interpret these escapades only as expressions of anachronistic neo-imperialism, or overreactions of Russian survival anxiety, in the face Western expansion, underestimate the intellectual abilities of Putin & Co. It is true that the Kremlin justifies its hegemonic ambitions in the post-Soviet space to the Russian and international publics with patriotic interpretations, such as the supposed geostrategic, security, and economic interests of a Russia allegedly squeezed by the West. And apparently a large proportion of the Russian public, as a result of years of brainwashing by Kremlin TV propaganda, as well as some naïve or corrupted foreign observers, have adopted these justifications. However, the apparent geopolitical megalomania of the post-Soviet petro-state has far more rational underpinnings than psychotherapeutically engaged Putinversteher are prepared to acknowledge. Putin and his associates are no paranoiacs, but are instead keenly aware of Russia’s external unassailability as a nuclear superpower. They are cold-bloodedly using the Russian nuclear forces’ overkill capacity as a targeted deterrence, for example, against Western military assistance for Ukraine. Excessive emotion and geopolitical angst are less responsible for Russian foreign policy adventurism than tactical calculations aimed at the – at least, short-term – stabilization of the Russian kleptocracy. Russia should at best be seen only partly as a hyper-nervous ex-superpower plagued by post-imperial phantom pain, and is in no way the pitiful underdog in an American-dominated global system, as it is often presented by the Putinversteher. In Ukraine, the Kremlin is not pursuing misunderstood national interests, but rather the well-contemplated personal interests of its rulers. The Ukrainian model of democracy must fail; otherwise, its success could give Russians the idea to try something similar in Moscow. Moreover, the present Kremlin leadership damages Russia’s core international interests with its risk-filled foreign policy gambles in the Donbas and Syria; for example, regarding Russians’ relations with Ukrainians or with Arab and Turkic nations. Russia’s associated estrangement from its Western – not least German – political, economic, and scientific partners affects questions of strategic importance for Russia’s future. Arguably, Russians do not need a Eurasian economic union, but rather the EU as a partner for trade, investment, and modernization. In addition, Russia is suffering, from the chill with Western nations, in its relations with an increasingly confident China, which has deftly exploited this tension to gain inexpensive access to Russian natural resources. The self-inflicted political and economic isolation – as well as military overextension – of Russia, as a second-rate industrial power, do not bode well for the Russian nation’s future. The escalating arms build-up, which is decoupled from Russia’s overall economic capacity, amplifies already deeply entrenched pathologies in the Russian economy and society. Anyone who shows “understanding,” like the Putinversteher, for these missteps apparently has little sympathy for the Russian people and lacks real concern for the country’s future. The Putinversteher’s charges of russophobia against Kremlin critics are sometimes not just misguided. Some accusations of hostility toward Russia reveal that their authors’ demonstrative empathy for Putin is merely a foreign manifestation of the thoroughly corrupt and increasingly amoral social system the Kremlin has created in the Russian Federation. Just as the one-time KGB tormentors of Russian culture now promote patriotism to maintain their corrupt familial networks, the Putinversteher exploit their loudly expressed sympathy for Russia in pursuit of rather different domestic political objectives or personal ambitions. With each new wave of authoritarianism and every further international adventure, Russia is maneuvering itself deeper into a historical dead-end – a course of development that true Russia experts recognized years ago. With each passing year, the mantra of “understanding” Putin is becoming less of an expression of deep interest in Russia, but, on the contrary, a sign of indifference towards her. It is less the interests of the Russian people that many Putinversteher care about, but rather a diverse set of other motivations, from myopic anti-Americanism to prosaic material greed. Putin’s invitation to Germany’s Bundestag in 2001, the Nord Stream pipeline and other large-scale German-Russian projects, the Berlin-inspired EU strategic and modernization partnerships with Russia, massive Western direct investment in the Russian economy, and many other Russian-European municipal, academic, and cultural partnerships have not been able to prevent Russia from sliding into a parallel universe of international politics over the past 15 years. Instead, numerous European politicians’ chumminess with Putin and restrained reaction to the continued presence of Russian troops in Transnistria, Abkhazia, and South Ossetia have achieved the opposite of their alleged aim. The appeasing approach of many Western – and especially German – politicians, journalists, and businessmen merely reaffirmed the Kremlin’s belief that it enjoys special privileges in the post-Soviet space. Following the Ukraine disaster, former German Chancellor Gerhard Schröder’s version of New Ostpolitik is now in shambles. The Putinversteher, who until recently had dominated the German media and are still heavily present in the German-language book market, have contributed to this development. When the children and grandchildren of today’s brainwashed Russians look back on these years, they won’t be thankful for the Putinversteher’s “understanding” for their country’s self-degradation. Post-Soviet Politics and Society” in Stuttgart.